Increased desire for more and better information by different industries resulted in increased sales of Business Intelligence solutions including Healthcare. In a given size of the company, which mainly composed by the number of employees, a company-wide usage of business intelligence software should follow a comparison of several leading Business Intelligence software solutions for relevant product portfolio as a first step. These providers can be expected to be able to represent the complexity required to maximize the integrity of data and in particular to ensure a safe protection of medical and personal information of the patient in conjunction with cloud computing platform. This article on Business Intelligence software solutions for Healthcare will focus on how far the manufacturers offer the right Business Intelligence software products– possibly even specific solutions for the healthcare sector. Likewise, the issues like costs and prices are not investigated. Prices of the software solutions of this magnitude are usually not published publicly, but are usually based on an optimally defined requirement and profile of the potential user of the company. This article is designed for the general users and is user-friendly along with a PDF there format attached for citation purpose by scientific papers. Both the central concept of the topic as well as other important terms for understanding the supplier, their products and the selected comparison criteria are briefly explained and discussed in the appropriate context . The comparison criteria used and their relevance are presented and explained where needed. These ends with a summary and a brief outlook for further research opportunities and developments within each paragraph. Each section is an overview of the key factors, concepts and provides the relevant context without claiming to be exhaustive. Where possible, the global health care system and relevant factors is/are considered for the health care market. However, since the software industry is dominated by the American companies and many studies rely heavily on use of Business Intelligence Software from North America, the data can not get the focus consistently in global context. Note the complex interplay of many institutions of various stakeholders and the ever-evolving medical disciplines under the influence of government regulation is the total health system. The following descriptions of health care now should provide an idea of ? ?the different perspectives and facets, which is helpful for understanding the diverse involvements. There are different ways to structure the health care system. In a broad definition of health, often which is called the health care system, composed of all the measures that can be taken at onset of illness, disability or for the purpose of defense against health hazards understood. Inpatient care, outpatient medical care, integrated care are the parts of the medically dominated areas. In addition, the non-ambulatory medical care by physical therapists, speech therapists and many other types of therapists, called “remedies” in the Social Security Code are also included within this terminology Healthcare. In addition there are the institutions for financing health lines by statutory and private health insurance, general government, employers, nursing care, and not the least – households. Similarly, there is the concept of division into a first and a second hand health market. The first healthcare market hereafter covers all the services those are covered by a health insurance company and therefore are usually considered medically necessary. In contrast, the second health market includes all the other services which are taken as Individual Health Services, which also includes partially additional services through the opticians, pharmacies, sporting goods, health tourism or areas such as oral hygiene. From a point of consideration of the healthcare costs, it can be divided into different types of benefits. The three main types of benefits – the medical service provider with 30% share, followed by goods with 25% share, among which all drugs, aids, dentures and other medical supplies falls and a third type is the nursing / therapeutic services with 25% share. The remaining percentage is covered by accommodation and food, Administrative services and other areas such as investments, prevention of ill-health and transport. The increase in the demand resulted in spending in Business Intelligence software in Healthcare which on average per year is double digits. In 2014, it will probably go up to 14 billion. The turnover of all the leading providers has grown steadily in recent years. Here, however, there were only minor changes in the division of the market. About 70% of the global market revenues are generated by the 5 largest provider – SAP, Oracle, Microsoft, SAS and Microsoft. About 30% of companies use only one supplier. Almost half uses two to three different tools and 25% have four or more different solutions. On the supply side of the Business Intelligence software market, was initially from smaller innovative companies. Meanwhile, the aforementioned major software manufacturers have partially established through acquisitions of the Business Intelligence softwares from others. The major resources of these companies led to a change in the market. At the same time, however, it is also clear that the requirements of BI software for the healthcare sector and are highly specific. It is now no longer just about the standard analysis of financial data, operational and medical data if compared with classical figures. In order to remain competitive and respond flexibly to changes in the future, individual ad hoc reports are also used and if possible also the forecasts. Currently, there are few solutions for the healthcare system itself. In principle, three core areas which are preferably represented and supported : financial, quality control and management of processes and medical innovation. It possible to reduce the costs and increase the quality of the medical services received or at least making it remaining static. This is quite possible, as the many Centre shows. In cooperation with health insurance, it is possible to develop an interdisciplinary approach, which is achieved better with patient outcome at lower costs. This was achieved through the cooperation of two actors normally of divergent interests in some studies. Treatment outcomes and costs were measured as accurately as possible and mutually shared openly. Finally, the health insurance began deliberately choose insured model, which stood out to be more expensive care with worser results. So lack in proper model basically creating the odd scenario. A win for all the three parties with a proper Business Intelligence software clearly from these studies are for the health care provider, insurance company and the patients. The Harvard Business School published bout a study back in 2007 in this context. The many challenges and uncertainties in planning the healthcare industry is applicable to a software industry that provides hitherto little-specific solutions for one of the most important business market in the world. Instead, it usually tries overall gross Business Intelligence Software solutions adapted to the requirements of the healthcare market. Traditional reporting tools that works in other sectors of the economy has long been standard here show no differences between the providers and therefore bring little new overview. This Article Has Been Shared 2623 Times! Cloud Computing for SMBs can empower the full IT department avoiding the one time investment and recurring costs at the same quality like that of enterprise. Red Hat OpenShift PaaS is now officially out of their Beta. Obviously our favorite Free Tier of usage is remaining plus you can opt for official paid support. 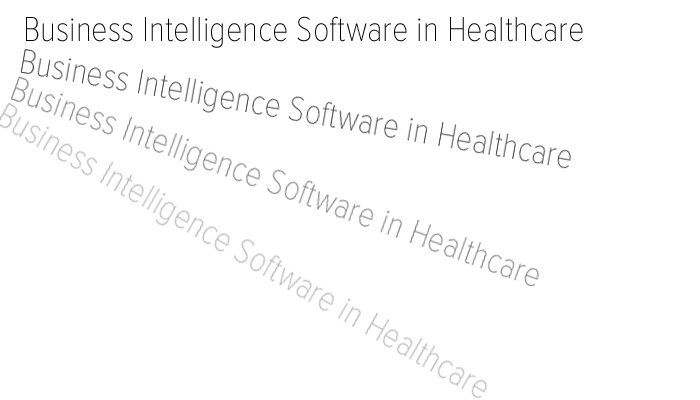 Cite this article as: Abhishek Ghosh, "Business Intelligence Software in Healthcare," in The Customize Windows, October 30, 2013, April 21, 2019, https://thecustomizewindows.com/2013/10/business-intelligence-software-in-healthcare/.